As promised (though rather delayed) here are some photos from our first day in beautiful, charming Paris. Iceland Day 6: Penultimate Post! This will be the second to last post about the most beautiful and refreshing place I’ve ever visited. I will miss a number of things about Iceland, which I will enumerate in my last post, but can be summed up as: how the hell did this little island slip my travel plans. It was only because of Mr. Chokkattu that I thought of this place at all as a potential destination and that’s insane to me now. Something light and fairly cheerful today! Derring-Do doesn’t smell like soap! I’m so happy. With the cedar and the aquatic notes I get from this, it seems like more of a masculine scent, if only because these are notes marketed within the male fragrance sphere. It’s warm and a little sweet from the floral and pepper notes, and while it’s a little complex right up to the nose, it’s fairly harmless from afar. Like an every man’s kind of scent, and not in a bad way. This would be quite welcome in an office full of Acqua di Gio and Ralph Lauren, but it probably wouldn’t really stand out. It’s warm and clean, and a scent that’s comfortable and inviting. Perhaps this would be best on a young man wearing a navy blue sweater vest. 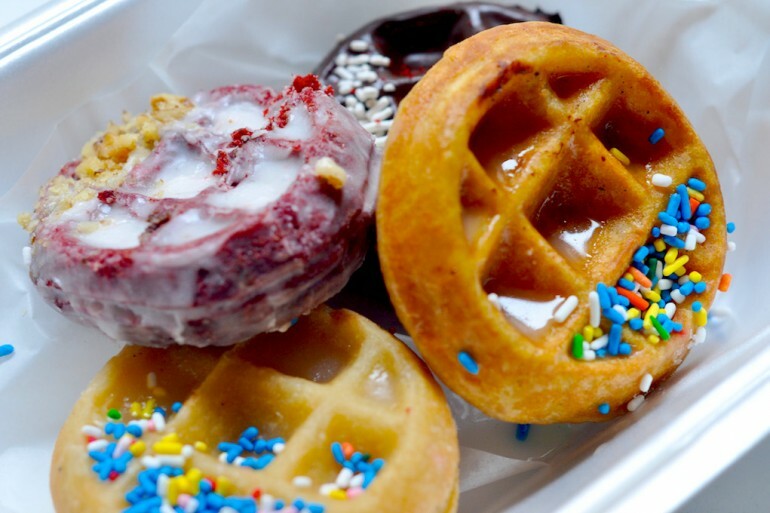 I have just been alerted to the fact that waffle donut hybrids exist and can be had at the Waffles Cafe in Chicago. While this is wonderful, because donuts with the slight chewy and crispy texture of a waffle just goes so well with the sweetness of a donut (think cruller; those are my favorite types of donuts!) it is also terrible because I haven’t been to Chicago in years, I’m really bad at saving money, and I won’t be able to go until I have both money and time. And as the last semester of my undergraduate life is starting today, I may not have time until months from now, let alone money saved up. Oh. Today’s the first day of the last semester of my undergraduate life. Let’s hope this is the last semester, and I start my real adult life soon after *crossesfingers*.